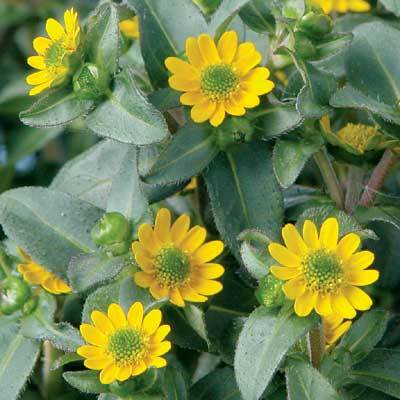 Flowers: small bright yellow flowers continuously for many months. An Easy care plant. Try to keep foliage dry as much as possible. Landscape: Courtyards, pool surrounds, patios, decorator pots and hanging baskets and sunny garden beds. Shape: Low growing to 15cm high by 30cm in good conditions. Sanvitalia Superbini loves sun and light, but will also grow in part shade. This is a tough little plant that likes hot, dry conditions and resents overwatering. It will thrive in poor soil, and needs little fertiliser. Avoid root disturbance when replanting and allow some space around the plant for good air movement. Trim back after flowering by about one-third.